Cold Iron Pick was an item I did not have before I visited The Stockade with my warrior. 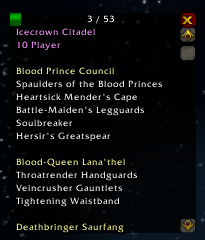 In the addon it showed two other items and only those items that I did not have collected. Why wasn't Cold Iron Pick showing as uncollected before I looted it in The Stockade? thank you for your addon! is it possible to hide dungeons from the list? - The Same item appears multiple times. - Some items don't show up (seems random). - I have clicked completionist mode but still learned and learned by other are still shown. Else, it's pretty nice and decent way to hunt missing gear. Great addon thank you for this. 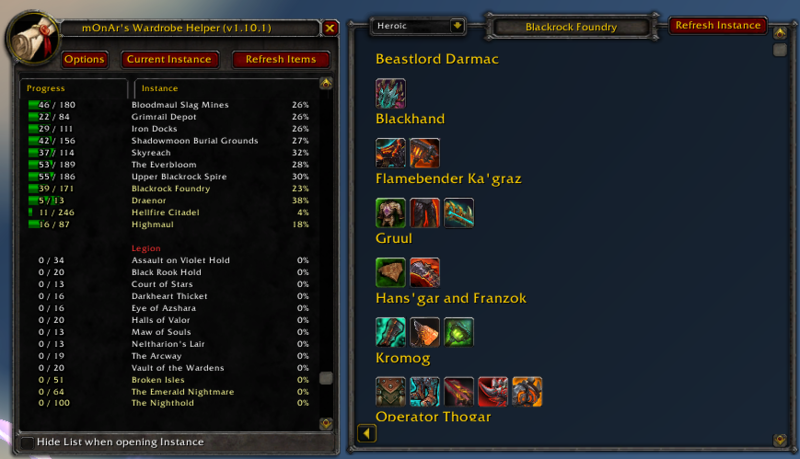 Will this be updated now that 7.2 has a set tab? I hope so i prefer this addon over the one Blizzard stuck in. I've been using this for a little while now and I've noticed that sometimes an item drops from a raid/dungeon boss, and although it is not listed by this addon as an item I need for the wardrobe, it still gives me the message "... has been added to your appearance collection". Is this a bug or could someone explain how this works? Have I collected the appearance from a different item? It's most likely an item that you unlocked the appearance of via a different item previously. You could unlock the Rogue T9 set for rogues by buying it from the vendor, but still get the "... has been added to your appearance collection" message when you loot the off-tier pieces with the same appearances from running ToC itself. in the last weeks i started to farm transmogs again a bit more than before. so i found some bugs?/problems?/weird things that are happening. in gnomeregan it shows im missing gizmotron megachopper on my paladin and on warrior it doesnt. edit: ive looked on my deathknight now and it makes those examples even more strange. on dk: treants bane shows, megachopper shows jackhammer shows. I had the same issue with the Tribute chest. Also in Blackwing Liar the trash weapon drop didn't appear until 5 minutes ago for some odd reason. Not fun to have to go back when I basically set myself "I completed this Dungeon/Raid". Edit: I relogged and now the remaining Tribute Chest item (2h axe) is gone again. Hey long time since i postet here, but want to suggest some thing. Great addon and I use it all the time. But there is one thing I'd love to change, and thats the way it track if you have the appearance or not. There is a ton items in the game that have the same model (and color), just with a different name, and then it can say "You've collected this appearance, but not from this item". Is it then possible to either just hide those that you have the appearance of (even if its not from that specific item), and/or make the % in the main frame include them. Do you have set a checkmark at "Completionist Mode"? Try to remove it. If I understood you right, this should solve your issue :). Is there any planning to add pvp sets and dungeon sets in the future? Probably not the place to post a bug, sorry, but I haven't got time to search around right now. I'm a mail-wearing BM Hunter running dire maul and your addon is fantastic, but it's displaying a leather item for me from the dire maul tribute chest. This is probably a long shot, but is there any chance support for tier items could be added in the future? It works great for the raids that drop the actual gear pieces (Molten Core, BWL, etc) but not-so-great for the raids that drop tokens. As is, I'm using MWD for everything in a raid aside from sets, which I have to look up manually and make notes on. If tier could be folded into this somehow, it'd be super.